A friendly reminder, we are looking forward to seeing all of you on Aug 18, 2018. Carafe Meadowvale located on 6400 Millcreek Dr, Mississauga, serving the community with its well known craft wine making experience for almost 20 years – same location and same great tasting craft wines (or even better!) and now with a brand new management. 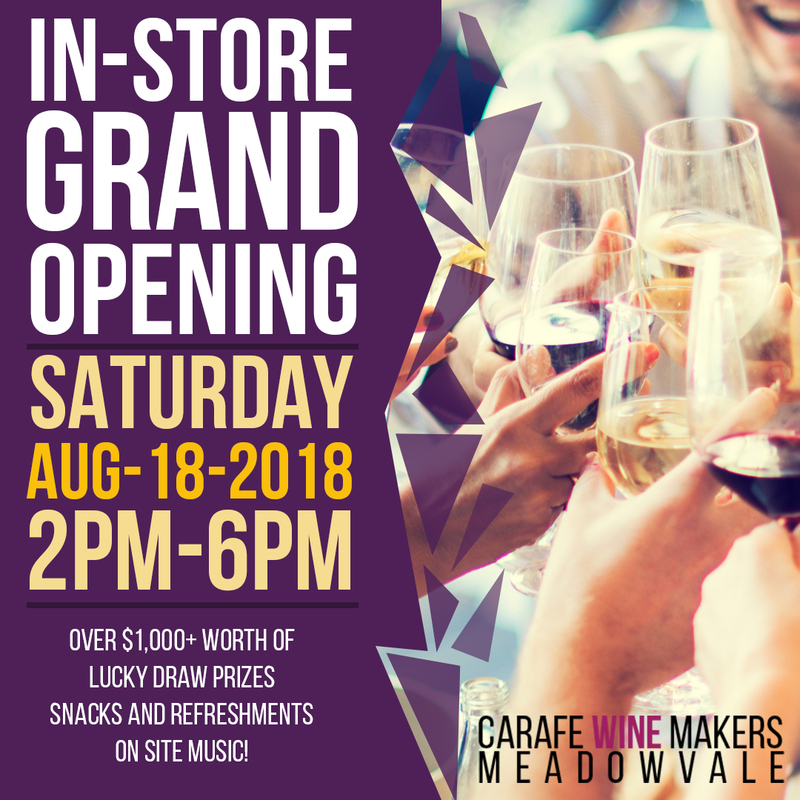 Carafe Wine Makers Meadowvale proudly announces the re-launching of its “Brand New” contemporary image both in store and in our marketing which everyone is talking about. Enjoy a whole new wine making experience with Carafe Meadowvale, we are your today’s craft winemaker of choice!. Together with Tina, our new sales and operation manager, we welcome all of you; past, present and future clients, supporters and suppliers, to our grand re-opening celebration on August 18th 2018(Saturday) from 2:00 pm to 6:00 pm. To grace the occasion, we are giving away lots of prizes and much more! 10 x $50 Visa Cash cards which means more chances of winning. 1 happy winner to an enchanting dinner for 2 (value at $300 with wine pairing) at the renowned Trius Winery Restaurant in Niagara Falls. 10 x $60 membership, each winner will get a 6 months membership to our exclusive “GO-TO” Fun and Activity Club. Not a “GO-TO” member yet? – On Aug 18, we will be extending to all of you an invitation to join our exclusive “GO-TO” Fun and Activity Club membership. The following are just some of the benefits and activities that comes with it. Get to experience many more activities**** at member’s pricing (up to 50% off, non members pay full price). How to be a part of our exclusive Carafe “GOTO” member? Just $10 per month, a minimum 6 months to be paid thru your credit card. Membership will automatically cancelled unless you renew at the end of the 6 months. And if you sign up to be a member between Aug 18 to Sept 18, you get a an additional 3 months “FREE” at no extra charge. * Applies to selected kits only, HST of $3.90 per kit is payable and is extra. One kit per household with valid ID, must be of legal drinking age, Management reserved the rights to limit quantities and are subject to availability. Bottles are extra, all offers are subjected to change without notice. **** Activities are social events and are not related to either directly/indirectly to nor to promote wine (alcohol) drinking. Carafe Meadowvale Newsletter August-September 2018 New Limited Release White Sangria Now Available!